I am having trouble with a GitHub library. Can I create a fork and use that? Or make the changes, and see if the origin library will accept the changes as a push request if it’s a bug or missing feature. Otherwise, you’ll want to update the library.json details so that it has your name as the maintainer, correct repo url, etc, and then register the library if you want it to be available via the library manager. I forget that REPLYing by email does not do anything. That worked and some errors were corrected. The library.properties file at GitHub has been updated with a new version number and maintainer. Now I need PlatformIO to refresh, but the URL has not changed. The changes in the repository have not gotten to PlatformIO. I have now gotten PlatformIO to find my reupdated personal version of the registered PID library. I had to change the repository name. There must be an easer more direct way. Yes. Thank you. I under stand your confusion. I have other posts at Arduino. Other details are there. I will tell a more complete story from here from the begging. I would think that there a more direct way to get the new changes to PlatformIO than to change the repository name. Ah… that makes sense now. So, if you make the changes on GitHub, you want to know how to get that to update locally? I suspect that if the library manager checks for updates, it would look for version number changes in the library.json to indicate that there is a new version of the library. 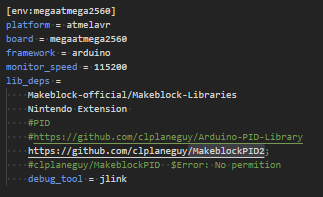 Otherwise, it would be a matter of using the terminal in the IDE to navigate to the .piolibdeps folder, then your MakeblockPID, and then do a git pull to pull any updates/changes.